Airbrush Art Shop: High Quality Custom Airbrush Art That's Affordable for T-shirts, Portraits, and more! What can Airbrush Art Shop do for me? Have your loved ones, your dog, your car, a celebrity (or anything else you have a picture of) custom airbrushed onto a t-shirt, vanity plate, leather jacket or vest, denim jacket, wheel cover, helmet, or any other paint-holding surface! T-shirts are included in the price (unless otherwise stated)! You get a quality 50/50 heavyweight t-shirt, beautifully airbrushed, heat set, ready to wash and wear! 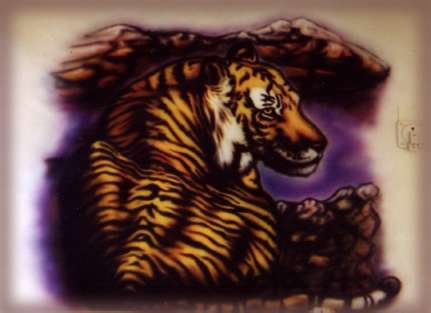 All airbrush art is done personally by JD, a professional artist with 18+ years of experience and thousands of happy customers enjoying their custom airbrushed art! Quick turnaround and fast shipping for those special gifts! Browse the gallery for samples of JD's artistry! Click here to send an email! JD will contact you promptly!